Last Tuesday, I spent a wonderful evening at the BAFTA building in Piccadilly, London, for the launch of a new campaign from the Wildlife Trusts, one of the most inspiring and proactive wildlife organisations in Britain. As part of their new Wilder Future campaign, they are calling for a nature recovery network to help reverse wildlife declines in the UK - one of the most nature depleted countries in the world. Our ‘green and pleasant land’ has long been spiralling into a desolate state, but the ability to reverse wildlife decline is entirely within our grasp. Most of us now realise that protecting nature isn’t a luxury - we can’t treat birds and bees like pretty things in the garden that we’d rather not lose. We rely on a healthy ecosystem to survive, and without wildlife our species is doomed. Sounds gloomy? It is and it isn’t. While the health of our wildlife has never looked worse, as a nation we also have all the technology, money and skill to transform our landscape back to a buzzing, vibrant paradise for people and nature. All we need are two things - urgency and action from the government, and people power to make our own small changes and stand up for nature. Back in Piccadilly, we were treated to a premiere screening of a short film trailer for The Wind in the Willows, designed to highlight how much wildlife we have lost since the story was first published over a hundred years ago. With voices from David Attenborough, Stephen Fry, Catherine Tate, Alison Steadman and Asim Chaudhry, it’s a beautiful little film and one I urge you to share with friends and family today. What I love most about the Wilder Future campaign is the focus on a Nature Recovery Network. When we’re faced with so much bad news, it’s easy to become overwhelmed and feel there is nothing we can do. But this couldn’t be further from the truth - small actions are just as important as new laws, policies and nature reserves. With every coffee cup we turn away, every house powered by renewable energy, every time we walk instead of drive, every meat-free meal we enjoy, and every piece of fast fashion we refuse to buy - all of these small actions will add up to huge changes, and every little thing we do is reducing our demand on the planet. The Nature Recovery Network is based on building connections with our landscape. So many of our problems come from losing connection with the natural world - an apathetic view of nature that means we often see it as ‘the other’ - something to look after, to exploit, to inspire us or get in the way - but always something ‘over there’ that has nothing to do with us. But we are all part of nature, and all the damage we do to the natural world will, without doubt, come back to haunt us if we don’t do something about it. Similarly, if we can work together to rebuild and replenish the natural world, we will all feel the benefits. 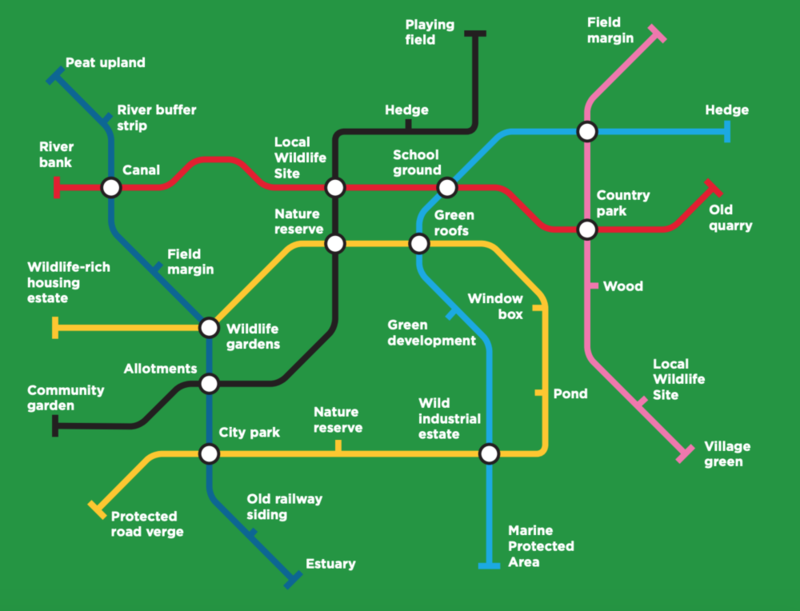 This little diagram breaks down the perhaps overwhelming world of nature conservation into manageable chunks, so that none of us have to be qualified conservationists to make a real difference to wildlife. If you have a garden, work on an industrial estate, live near a field margin or teach at a school, there are so many ways to start reviving nature and creating a wilder future for us all. Click here to find out more about the Wildlife Trusts’ Wilder Future campaign, and join the campaign for free to receive useful ways you can make space for nature near you.